Two legal concepts have become fundamental to questions of resource allocation in the modern state: rights and queues. As rights are increasingly recognized in areas such as housing, health care, or immigration law, so too are queues used to administer access to the goods, services, or opportunities that realize such rights, especially in conditions of scarcity. This Article is the first to analyze the concept of queues (or temporal waiting lines or lists) and their ambivalent, interdependent relation with rights. 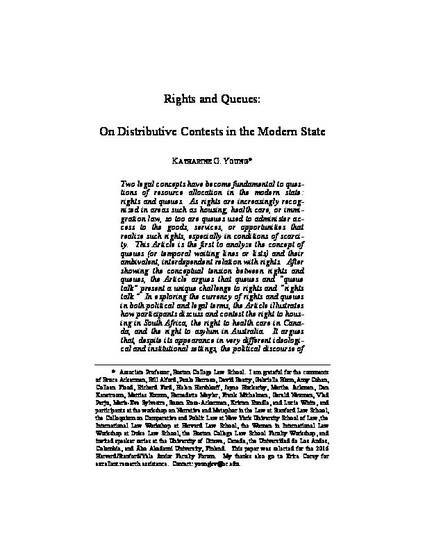 After showing the conceptual tension between rights and queues, the Article argues that queues and “queue talk” present a unique challenge to rights and “rights talk.” In exploring the currency of rights and queues in both political and legal terms, the Article illustrates how participants discuss and contest the right to housing in South Africa, the right to health care in Canada, and the right to asylum in Australia. It argues that, despite its appearance in very different ideological and institutional settings, the political discourse of “queues” and especially “queue jumping” commonly invokes misleading distinctions between corruption and order, markets and bureaucracies, and governments and courts. Moreover, queue talk obscures the first-order questions on which resource allocations in housing, health care, or immigration contexts must rely. By bringing much-needed complexity to the concept of “queues,” the Article explores ways in which general principles of allocative fairness may be both open to contestation and yet supportive of basic claims of rights.